News Update: I have not mowed the grass on a Sunday since my previous post on the topic. I’m feeling good about that, but my wife and I are planning on driving a very long way on this coming Sunday. Back to the matter at hand, though. At the beginning of this summer, I had a great lawn care plan pop into my head. Typically, I need to mow the grass for the first time in April and do it roughly once a week until about October. If my records are correct, I average twenty-four mowings per year. So this April, I decided to work ahead. I mowed on April 10 and then on April 12, April 13, twice on April 14, and once a day until I reached twenty. I figured that I could do the remaining four mowings on some cool October Saturday and call it a season. This seemed like such a great plan, but then the guy from the city waded through the two-foot-tall bluegrass to come to the door and issue me a citation. Clearly, our civic leaders have no vision regarding alternative work patterns. 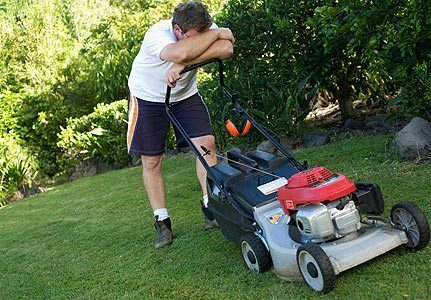 The reality of lawn care is that no matter how much work we try to do ahead of time, the task is never done until we don’t own the lawn any more. It doesn’t matter how many times I mowed last month, I still have to do the job this week and next week, and next month, and next year. Similarly, we cannot complete our obligations to God ahead of time. I can’t observe “Sabbaths” seven days in a row and then have nearly two months to spend as I want. I can’t work my tail off serving God for a couple of years and then declare that I have “done my time” and go into retirement. God has given us lives that we’re to work through just as surely as we care for our lawns. Ignoring the work to be done is not an option. Working ahead is not a real possibility. Instead, we are to continue serving and stewarding until relieved. Paul understood this, although I don’t think he owned a lawnmower. In 2 Timothy 4:7, he doesn’t speak of running hard for part of the race or of struggling through part of a fight. Instead, he sees himself nearing the end of life but pushing through the finish line or the final bell. I have mowed the good grass? I have finished the yard? Yes, but only until it needs it again.